Hearthstone’s science-themed expansion The Boomsday Project drops tomorrow, and players are out in numbers doing what they do best: speculating about which cards and classes are going to be overpowered once the expansion is live. A few common themes have already made themselves clear, namely: that Boomsday looks like one of the strongest sets released in recent memory, and that the Druid class looks like it’s going to be wildly imbalanced once the set actually drops. “This seems like it has the potential to be very explosive,” Hearthstone shoutcaster Cora “Songbird” Georgiou told me last weekend at a pre-Boomsday release event in North Hollywood. By comparison, the previous expansion The Witchwood “had a little lower power level… there was good variety in the meta, but nothing super crazy,” she said. 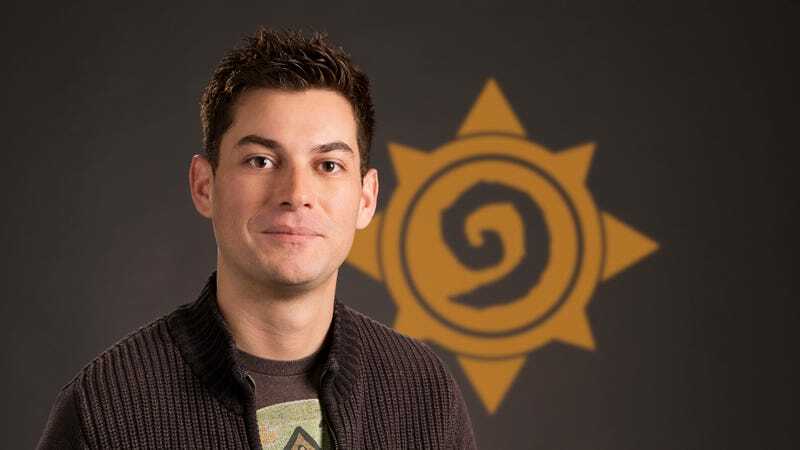 To get a sense of whether claims like those might actually hold any water, I spoke to Hearthstone Lead Balance Designer Dean Ayala at the event to get more insight into the design philosophy behind The Boomsday Project. Kotaku: Is there something that determines what the power level of an expansion should be? Dean Ayala: The power level of an expansion ideally is the same relative to each other. The idea when we’re making a new expansion isn’t to make more powerful cards than were in the previous expansion, it’s to make new decks that maybe you haven’t seen before, and make things that maybe didn’t get all the way there within the previous expansion a little bit better—but certainly not to make more powerful stuff than existed, or invalidate some of your old cards. Kotaku: One of the main themes in this expansion is science and experimenting with new card interactions. How do you test for these? Ayala: We design cards for a lot of different reasons. There’s a card called Shrink Ray. We didn’t design that card for any particular reason like, it’s gonna impact the meta or these Paladin decks in such a way. It’s like, well, we should probably have a Shrink Ray, it’s a science set. We’ll make minions small, and that’s cool for science. Sometimes we’ll target things like, what’s a specific type of deck that people haven’t seen before? 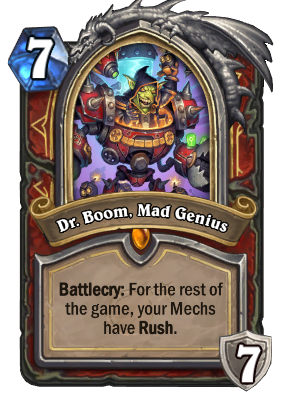 When we make a card like [Dr. Boom, Mad Genius] that says “For the rest of the game, your Mechs have Rush”—that’s gonna be a deck that you haven’t seen before. Not only is that cool thematically for Dr. Boom, but when we make a new set, one of the core goals that we have is to introduce some stuff that people haven’t been playing with in the old expansions. So when you log in, and you’re playing on day 1, and you queue ladder, and you play 5 or 10 games, it feels like this is a new expansion. And one of the best ways to do that isn’t to just add new cards to old decks, but just create totally new decks, because that’s really what feels new. Kotaku: What went into designing the “flavor” aspects of this expansion? Are there any aspects of the Boomsday theme that you’re really into, or that people might not have picked up on yet? Ayala: Hopefully people are getting all the flavour hits we tried to put in there. The “Project” [cards] were cool to us because when we think of science, we think of being cooperative, and doing projects together, so doing things for yourself and your opponent was kind of the flavor for that. The scientists and their spells are supposed to work together—maybe not in the same deck, but they just have sort of the same theme going on. 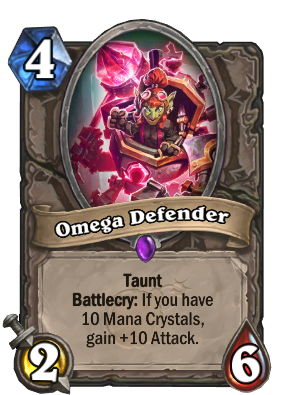 The Omega stuff that we’re doing is like, if you have 10 mana you get this crazy bonus [effect]. The flavor of that is supposed to be, what are the top secret projects that all these characters are working on? The Omega project is the codename for these special projects. The theme is mad science, so we had to do a bunch of cards that seem crazy and wacky, that when you open them they make you think: “Can they do this?” That’s the vibe we were going for. Kotaku: There are a lot of combo-oriented decks being theorycrafted going into this expansion. In the past, the team has been somewhat opposed to certain types of combos, but there seems to be some space for them with the cards you’re releasing this time around. What’s the team’s current approach to combo decks? The issue with these decks is that, a lot of people, when they think of combo decks, they think of decks that don’t really engage much with what the opponent is doing, and then all of a sudden, destroying your opponent from full life. And those things can be pretty frustrating, I think, for the opposing player. Combos are awesome, but they don’t always have to be combos that destroy the enemy hero from full life, or combos that don’t interact with your opponent at all. Like, we have a card called Myra’s Unstable Element that draws your entire deck. 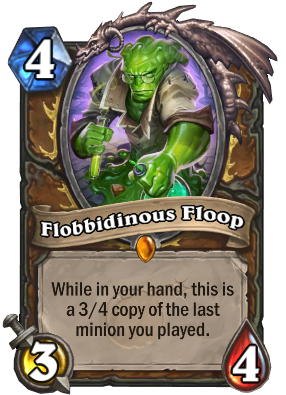 There’s some cool combos you can do with that, where you can shuffle a bunch of really awesome cards back into your deck, and now you only have those ones to draw because now your deck is empty. And that’s an example of a combo that is really fun for you to pull off, but also not necessarily really unfun for your opponent. Of course we end up with stuff like Shudderwock, that is frustrating for some people, but is also one of the most unique decks in Hearthstone. So a lot of times, even though they can be frustrating, I think there’s a lot of positive there as well. Kotaku: A lot of people are concerned that the Druid class is going to be overpowered, since it’s getting so many great new cards and it’s already the most powerful class in the game. Do you ever use a new expansion to help balance the game if people perceive it as being out of balance? Ayala: One of the biggest things about balance is, in fact, perception. Of any of the card changes we’ve made in the past, very few of them are actually because a deck or a card is statistically more powerful than the rest of them. It’s the perception of that card, or it just feels bad to play against in certain circumstances. There’s been a lot of talk around Druid, and Druid being very powerful, and cards like Floop being very powerful, and Dreampetal Florist, and Juicy Psychmelon. I’ve read all the threads on those, and, my answer to that is that the expansion’s not out yet. We’ve done a lot of playtesting, we hope the expansion is in a really good place, and if it turns out that there are any real issues that arise, we’ll fix them.